Having raved about how everyone must surely love Raiders of the Lost Ark, I then watch Temple of Doom and think to myself “Ah, see, people love this film, yet I hate it. Perhaps some people don’t love Raiders of the Lost Ark.” Yes, it’s still Harrison Ford being Indiana but… oh, there is so much wrong with it. The story goes that Indiana is selling the remains of the first Emperor of something to a guy in Shanghai for a big diamond. He is double crossed and ends up drugged and dragging an American singer with him out of the club, through town driven by a small Chinese orphan Indiana has found and onto a plane. However, there are issues here, too, and the planes crashes, leaving them stranded in India where they are sent on a mission by the townsfolk who find them. Of course, it is not easy, and there is some screaming and stuff. Firstly, why was Indy suddenly selling the items for profit? At least in the first film he was avoiding the Nazis. But now he’s into the cash? Second, why have such a cool, strong female lead in the first film (even though she had to be rescued and stuff, she wasn’t going to be pushed around), then a squealing and totally unlikable woman in this one? 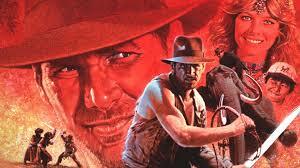 And what is the story with the Chinese orphan that Indy essentially kidnaps? He’s cute and says quirky little humourous things, but it screams of trying to appeal to a kids audience, and Indiana Jones films should be better than that. My theory is that every other Indiana Jones film is good – from memory, Last Crusade is fabulous, but then the more recent Crystal Skull was appalling. I’ve heard (god forbid) that there are plans to make a fifth. By this theory, it’ll be ace. Or totally destroy this theory. Indiana Jones and the Temple of Doom won an Oscar for Best Effects, Visual Effects and was nominated for Best Music, Original Score.